Top quality, easy mounting, bright white light. Bought 2, they adjust sidewsys when mounted, I can now increase the width of my light beam as much as I want. Bought on sale so I can’t complain about the price. HIGHLY recommended !!! I really love this light, I bought two of them one for me and one for my wife when we do night rides. They really work great and put out plenty of light. The mounting bracket is wonderful and has an ingenious spring clip that makes it easy to take off and on. I ride about 100 miles per week. I have found myself riding in total darkness on more than on occasion. This light is bright enough to see and be seen riding on the road. I ride with the flashing light on during the day. Perfect for being seen on busy bike trails (sometimes people focus on the light instead of getting out the way, beware). I would recommend that everyone have a flashing front light on their bike for daytime visibility. This is been a great light so far (about 6 weeks of use). I’ll probably get a couple more. I own several Fenix flashlights which I love. I’m a little disappointed with the 2 BC25R bike lights I purchased. They are not the same crisp, bright white light like my flashlights. 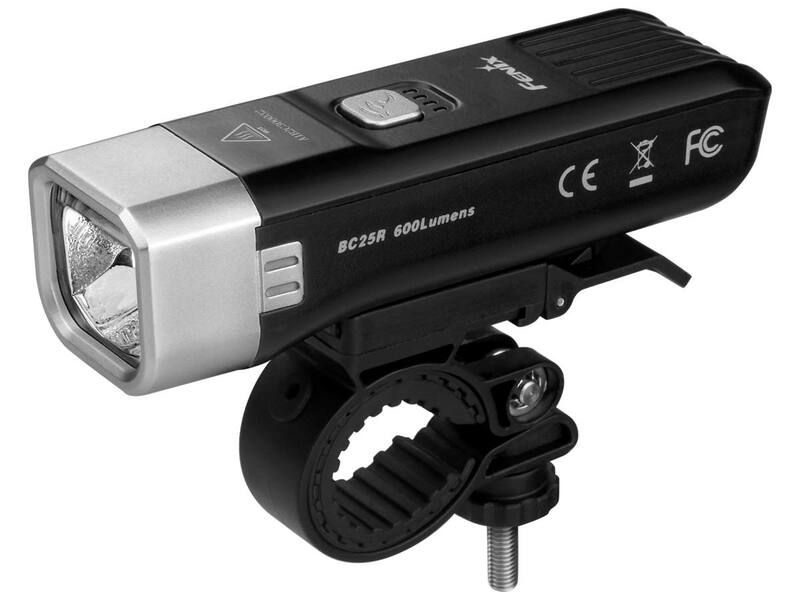 Maybe comparing a bike light to a PD35 Tac and a TK72R is not fair. But I was expecting more from a 600 lumen Fenix light. 600 lumens should be 600 lumens bike light or flashlight. A bargain price for such a quality light. Makes low light riding enjoyable and safer. To good to talk about. Fit right on the bike handle. Very sturdy. Slides in and out of a clip so you only have to mount once and is easy to remove for charging or taking with you so shady folks don’t steal it when bike is chained up. Different levels of brightness work well for different light levels. Always enjoy seeing Fenix products in my mailbox.